ALL GONE! 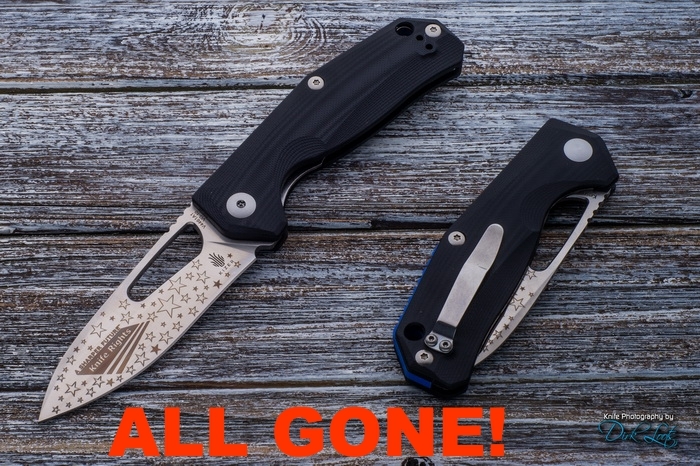 Kizer Cutlery Knife Rights 2018 Limited Edition "50 Stars" Kesmec A2 Linerlock Folder $108 Retail Value Without Engraving - FREE* to $100 Donors - ALL GONE! This Kizer Knife Rights 2018 Limited Edition "50 Stars" Kesmec A2 features unique laser engraving. On the front is the Knife Rights Sharper Future™ logo in a field of 50 stars that represent each state in the union. The back side is found another field of 50 stars engraved with our acclaimed "All Knives Matter!®" trademark. Graphic design compliments of Ari M. Weinstein. ALL GONE! This Kim & Azo designed, Kizer Cutlery built Kesmec A2 Folder is all-around dressed to impress. Superb balance and outstanding ergonomics on this mid-sized folder. Great for real world applications. The Blade: A modified drop point styled offering superior usability with a slight upper swedge and nice, pointy tip. Thick, premium VG-10 high carbon stainless steel has a satin/polish finish and large thumb hole window cutout. The cutout makes for quick, easy operation. The Handle: Very cool contoured, lightly textured orange G-10 handle scales provide strength, durability and curb appeal. Some machined grooves on each side add to the overall comfort in-hand. Smooth edges with inset liners and lock make the Kesmec the complete package. The Kesmec from Kizer is a solidly built folder. It's sure to handle most every day cutting tasks as well as lend itself to tactical applications. A reversible (left or right hand carry options) tip up carry pocket clip and large lanyard hole are included. It comes with a Kizer microfiber cloth.